Awhile back I posted a recipe for Spicy Maple Balsamic Vinaigrette Dressing. It's my favorite go-to dressing to whip up and toss over salads or use as a dip for bread. Like most dressings, it only takes minutes to assemble, plus is much cheaper and healthier than store bought brands. Unfortunately, most bottles you find at the grocery store or in restaurants (they often use commercial products) are full of processed ingredients and high fructose corn syrup. High fructose corn syrup (HFCS) or corn syrup is often the first or second ingredient listed, which means the dressing is mostly processed sugar! 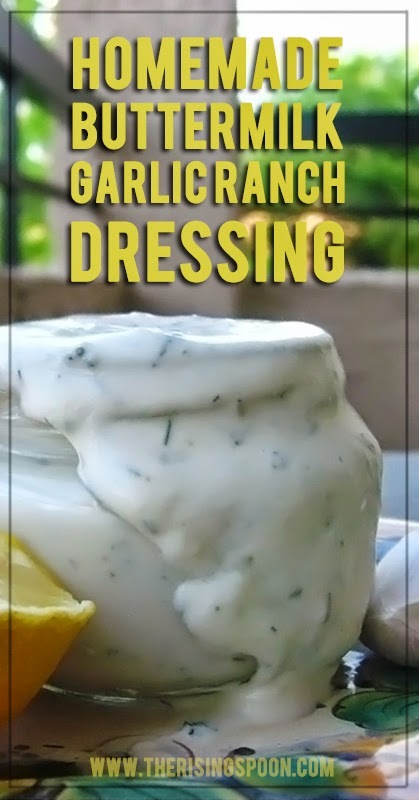 To avoid this, I've been making my own at home for years, but I have to admit that I've had to completely avoid ranch because I didn't know how to make it properly. Every time I tried a dry seasoning packet (even organic ones), it ended up tasting artificial and nothing like my favorite ranch dressings (unfortunately, ones served at bars and restaurants). Then I finally had an epiphany. If I wanted to make ranch dressing at home with quality ingredients, it would never taste exactly the same. That's because the commercials brands are seasoned with who knows what. Probably gross stuff like MSG, modified food starch and mystery "natural spices". So I finally took the initiative to buy dried parsley (I never cook with the fresh stuff), which I knew was imperative to an adequate ranch. I had everything else in my pantry or fridge already. The only thing that was unique to my normal buying habits was the fresh garlic chives. I bought a bundle at my local farmers market and am IN LOVE. I'm still trying to comprehend how I went years without knowing this stuff existed. If you don't have access to garlic chives, regular green onion would work perfectly. Or, just leave it out altogether. From there I experimented with the liquid ratios until I got the consistency I like, then added the spices a bit at a time until they were zesty enough for me. If you weren't aware, the shining stars of ranch dressing are lemon and dill (you might even argue parsley). That's what gives the dressing it's beloved kick. Of course, fresh and granulated garlic helps a lot too! Next time I'm adding EVEN more garlic. Yep, I'm a garlic fanatic. 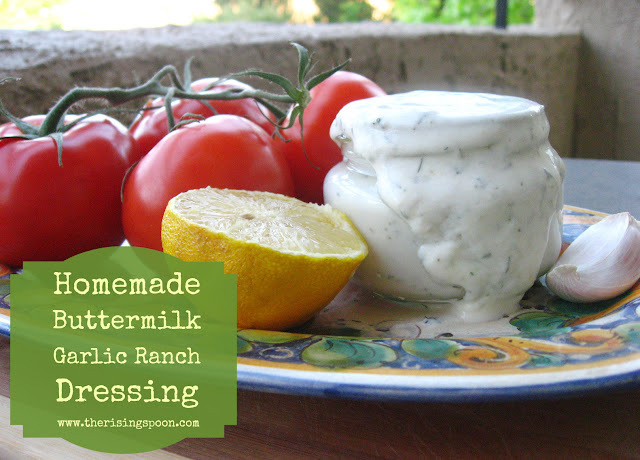 A zesty and slightly spicy homemade buttermilk ranch dressing with dried herbs, minced garlic, lemon juice and garlic chives. This fresh, creamy dressing made with wholesome ingredients is a thousand times better and healthier than commercial brands. If you're making the buttermilk substitute, mix that first in a separate container and let it sit for ten minutes. (If you like your ranch thicker, use 1/4 cup of buttermilk. I like mine runnier, so I used 1/2 cup.) Peel and mince the garlic and slice the garlic chives (optional). Combine all ingredients, in bowl and mix thoroughly. Let it sit for at least 30 minutes in the fridge to let the flavors incorporate. If you don't have access to grass fed dairy products, at least seek out organic versions so you can avoid pesticides and hormones. You might be tempted to opt for low-fat or fat-free ingredients. Please don't! For one, it's so worth it to go full-fat. It tastes much better. And two, low-fat and fat-free products are super processed and most have chemicals, additives, sugars and carbs added back in so they taste better. Also, A June 2012 study published in Molecular Nutrition & Food Research from Purdue University concluded that healthy fats are necessary for the body to absorb fat soluble vitamins (like carotenoids) in vegetables. So if you don't include healthy fats in your salad, you won't absorb the vitamins! What's your favorite food to eat with ranch dressing?